This was our plan all along, we just tried to break up the expense over 2 installs. Since we’re getting serious about moving the office, we figured the carpet should go before we do so. Macky looooves shredding that particular type of carpet and whenever he weasels his way into one of the spare bedrooms, he immediately goes to town. This would probably drive us crazy after about…. an hour of sitting in the new office. Then we bought a couch and a tv so the addition of the floors got put on the back burner. We like to only tackle a major expense at a time, so we’ve decided to wait until November/December to add the floors (depending on our contractor’s availability). In the meantime, Mike and I have been scouring Pinterest for some inspiration. Yes, Mike sneaks on Pinterest and sends me links to things he likes quite often. First, the chalkboard walls. 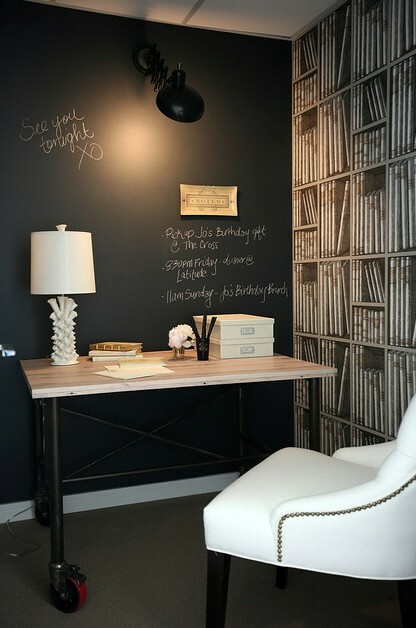 We want chalkboard paint walls behind our desks. We’re both desperately missing a space to jot down notes, code and to-do lists in our current office and chalkboard paint is the natural choice. 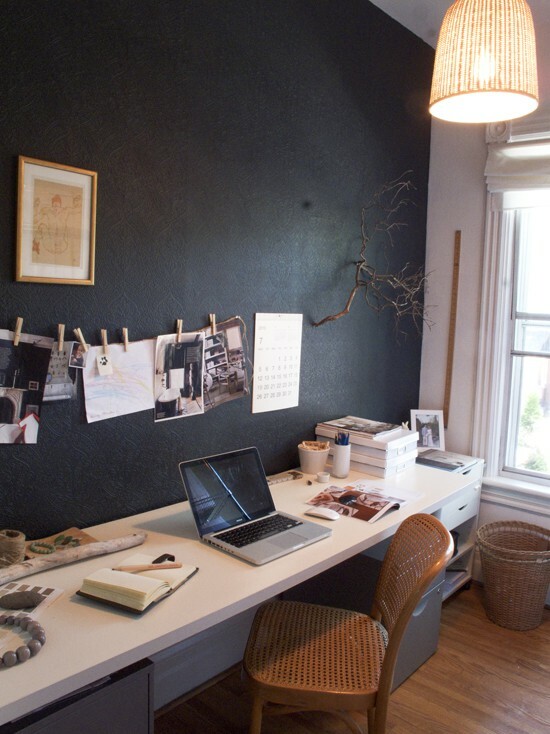 I love the clothesline for inspiration pictures in this one, though I’m not sure it’s chalkboard paint, it could be! 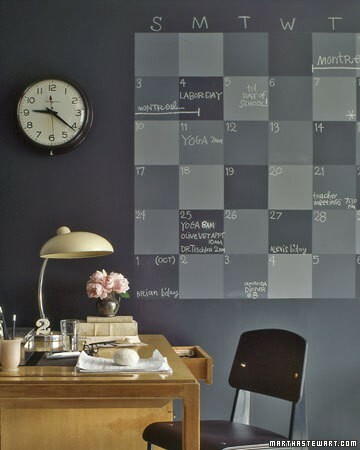 And the classic chalkboard calendar from good, ol’ Martha. Other than giant chalkboard walls and a built-in bench, we’re not entirely sure what we want to do with the rest of the room. The room is so large that it’s hard to visualize and I’m afraid we’ll end up with 2 smallish desks floating in the center of two 15 foot walls. Then today, Mike found a few ideas that I think can work for us. 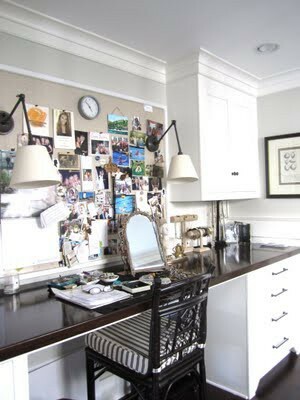 Second, maybe some high, open shelving to keep the “backsplash” area open for chalkboard writing. 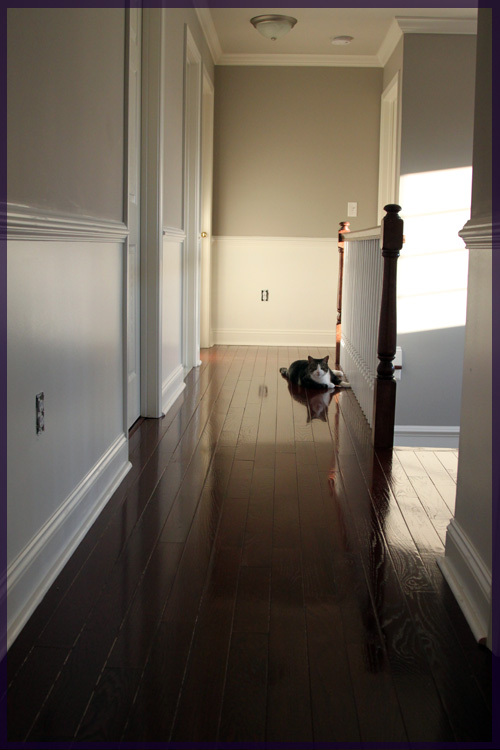 I’m dying to hardwood our upstairs! Our carpet is builders grade and I already can’t stand it. They say carpet is better for kids/babys, but we’ll end up with area rugs anyway. I’d also like to do an additional office in our sitting room. Or maybe a small lounge! Hm that’s an excellent point. I’ll keep that in mind! 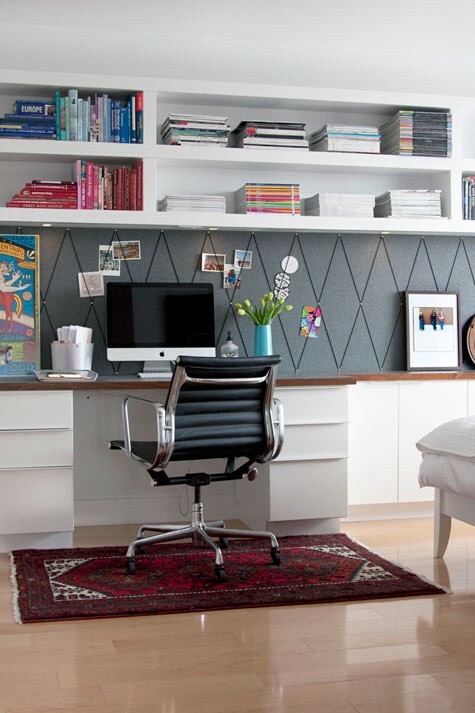 I was just going to say what Ainhoa said – chalkboard walls never stay super clean. There’s probably a way but I’m not sure what it is. Maybe you can paint before changing the floors? This way, if paint drips on the carpet, it’s not a big deal since you’re having it pulled out anyway.